Free Shipping Included! 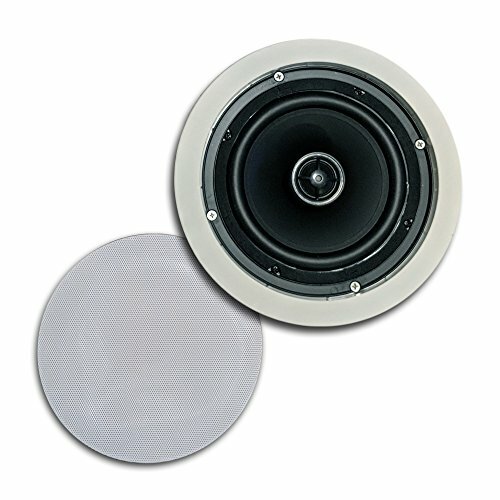 CT Sounds In-Ceiling Surround Sound 6.5'' 2-Way Home Audio Weatherproof Speaker (1 Speaker) by CT Sounds at movies-out.com. Hurry! Limited time offer. Offer valid only while supplies last. ✅ 25MM SILK DOME TWEETER: This set is a coax speaker having a 25mm silk dome tweeter placed in the middle portion of the 6.5 inch woofer. You can easily hear the high definition of the high quality silk dome tweeter. ✅ TOP NOTCH SPEAKER PARTS WITH PROLONGED LONGEVITY: This set includes Y30 ferrite magnet; yellow PC spider with white zinc coated top & back plate; separate crossover circuitry. Each and every part of this home audio 6.5 inch speaker is truly marvellous and built to last long; mounting depth: 73mm / 2.86"
If you have any questions about this product by CT Sounds, contact us by completing and submitting the form below. If you are looking for a specif part number, please include it with your message.